Panasonic has proved it’s still committed to its G-series Micro Four Thirds camera range just as much as its new high end full frame Lumix S series. The new Lumix G90/G95 model is a successor to the G80/G85 model and pitched at two distinct sets of users. One target market is amateur photographers looking for a more advanced camera that is still easy to use but offers a wide range of features, performance and value. Panasonic doesn’t see this as a camera for beginners, but for photographers ready to move on to more advanced picture-taking techniques. The other target user type is videographers, vloggers and content creators who want to capture high-quality footage with an affordable, portable camera that’s nevertheless rugged enough to cope with sometimes difficult conditions. The market for best 4K camera is hotting up, especially at the consumer end of the market. With the Lumix G90/G95, Panasonic is trying to get the best of both worlds, with a camera equally well suited to both stills and video and showing no preference towards either. The Panasonic Lumix G90/G95 has the company's latest 20.3-megapixel Live MOS Micro Four Thirds sensor. One of the big changes from the previous G80/G85 model is the inclusion of a new 20.3-megapixel Live MOS sensor. This has no low pass filter, so that fine detail is recorded as sharply as possible, and Panasonic says it’s ‘equivalent’ to the sensor in its more upmarket Lumix G9, though actually brand new. The new camera uses the same 5-axis Dual I.S.2 image stabilisation as other new Panasonic models, combining in-body stabilisation and lens-based stabilisation (depending on the lens) to offer up to 5 stops of shake compensation. The touch-sensitive vari-angle screen uses OLED display technology. Panasonic is also sticking with its DFD (Depth From Defocus) contrast-based autofocus system, running a 240fps in this model to provide high-speed data communication and a claimed autofocus (AF) acquisition time of just 0.07sec. It offers a subject tracking mode with adjustable sensitivity, Face/Eye detection, Pinpoint AF for extra precision and can work in light levels as low as -4EV. There’s also a manual focus mode with a focus peaking display if required. The continuous shooting speed is unchanged, at 9fps with the focus locked on the first frame, though this drops to 6fps with continuous autofocus. Naturally, Panasonic has included its proprietary 4K focus mode, which can capture 4K footage at 30fps and can be used for extracting 8-megapixel still images from bursts. There’s also a new Sequence Composition ‘stromotion’ (strobe-motion) mode for multi-exposure action effects – plus Panasonic’s very clever 4K Post Focus mode for choosing a focus point AFTER a shot has been taken. You'll be able to get the Lumix G90/G95 body-only, with Panasonics 12-60mm kit lens or a long-range 14-140mm zoom. 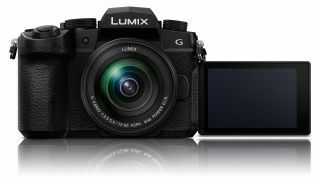 Video is a Panasonic speciality, especially 4K video, and the Lumix G90/G95 has been designed to appeal to the growing number of videographers looking for an affordable but capable video camera. For a start, the G99/G95 can capture unlimited 4K video (3840x2140) at 30p, 25p or 24p. This will be important to videographers working on their own who will often need to just keep the camera rolling. The G90/G95 can also capture full HD at 60p/50p with full-time AF, and there’s a High Speed Video option for slow-motion video in full HD at 120fps (1/4x), 90fps (1/3x) and 60fps (1/2x) speeds. Video is recorded at 4:2:0 8-bit internally to an SD Memory Card, but there’s the option to output 4:2:2 8-bit via an optional micro HDMI cable. The big story, though, is the inclusion of Panasonic’s V-Log L mode as standard, for a wider 12-stop dynamic range when using post-production software. This, and the inclusion of both mic and headphone sockets, makes the G90/G95 a pretty serious video tool, despite its amateur-orientated price point. There are three new buttons on the top of the camera for setting white balance, ISO and EV compensation. Panasonic has also done some work on the camera’s exterior design. It still has the DSLR-style shape of the G80/G85 model, but adds three new buttons for key shooting functions on the top plate, a higher resolution OLED vary-angle screen on the back and a redesigned grip to enable one-handed shooting. Other new features include USB charging, both Wi-Fi and Bluetooth LE and a Power Save mode that takes the battery life up to a claimed 900 shots. The Lumix G90/G95 will be on sale from June 2019. The Panasonic Lumix G90/G95 will be on sale from June 2019 both body-only and with a choice of kit lenses. The expected retail price is £899.99 for the body alone, £1,079.99 / $1199 with Panasonic’s 12-60mm kit lens or £1,259.99 with the Panasonic 14-140mm 10x zoom. The older 16-megapixel Lumix G80/G85 will remain on sale, but at a new, reduced price point.